I usually get my Pumpkin Spice Latte at Starbucks hot, but the other day I felt warm so wanted a cold version, as I’d never tried it anyway. 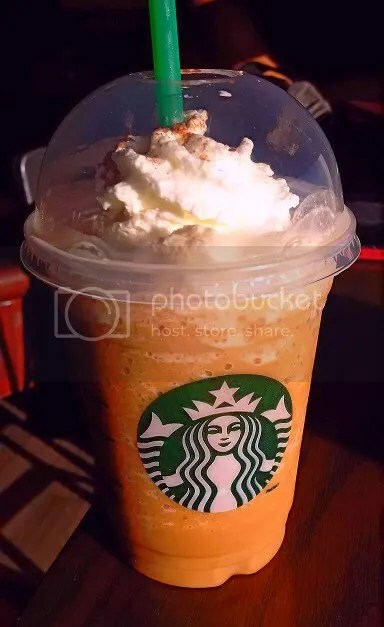 First I asked the barista what the Frapp version tasted like, and she said it tastes a lot more like pumpkin pie – SOLD!! So, gave it a shot, and it definitely didn’t disappoint!! It was like having a piece of pumpkin pie out of the fridge with whipped cream…omnomnom. I won’t lie though it WAS sweet, so if I have it again, I’ll ask for half sweet. If you like pumpkin pie or anything pumpkin, that comes with this time of season, then I think you’ll enjoy the cold version of the beloved ‘PSL’.